MAGIX Entertainment VEGAS Pro 15 Edit is the standard VEGAS Pro 15 application, without any additional 3rd-party video enhancement packages nor VEGAS DVD Architect included. It's ideal for you if you're currently not interested in additional effects, touch-up tools, and the like. VEGAS Pro 15 Edit is Windows-compatible. VEGAS Pro 15 builds on the heritage of powerful and efficient operation, comprehensive video/audio workflow, and open timeline. VEGAS was one of the first NLEs to let you mix virtually all file types on the same timeline without transcoding them, and that's still the case. Further contributing to the flexibility, version 15 adds a customizable user interface with many updates made to it, providing for a faster and more precise editing experience. VEGAS Pro 15 supports 4K resolution editing and delivery (up to 4096 x 2160), and offers stereoscopic 3D editing tools. Moreover, VEGAS employs powerful hardware acceleration technologies that take advantage of NVIDIA, AMD/ATI, and Intel graphics processing power (see Specs) to provide faster rendering of your edits. VEGAS also takes advantage of multicore and hyper-threading computer systems to maximize available hardware resources. By leveraging the full capabilities of the hardware and reducing direct CPU load, this ensures that more tracks and audio/video effects will be available for real-time preview, improved performance at lower latencies, and shorter audio render times. Other new features include easy to use picture-in-picture and crop OFX plug-ins. The first lets you position, resize, and animate picture-in-picture effects using real-time controls directly on the Preview window, enabling you to quickly create inset images. The crop plug-in allows you to zoom into a video or photo with the same real-time controls and to pan across and show different parts of it. VEGAS now also supports the ACES 1.0 Academy Color Encoding System, allowing you to take advantage of the modern color science and expanded color spaces of current cameras. It also features a LUT OFX plug-in that enables you to apply camera and stylistic LUTs to a media file, a single event, a track, or the entire project in order to achieve special color-grading effects and custom looks. VEGAS's audio toolset, with features such as time-stretching, adjustable velocity envelopes, DAW bussing, and 5.1-channel mixing with film-style panning, in many cases is enough for even the most elaborate projects, ensuring you won't have to export to a dedicated audio editor. You can record audio in a multitrack environment with input buses, professional metering, punch-in recording, unlimited tracks, and more. Automate your audio mixes with real-time envelope automation recording, join audio recordings with a variety of automatic crossfade types, and create mixes with assignable effects. Take advantage of high-resolution audio support and enjoy a large collection of audio effects. 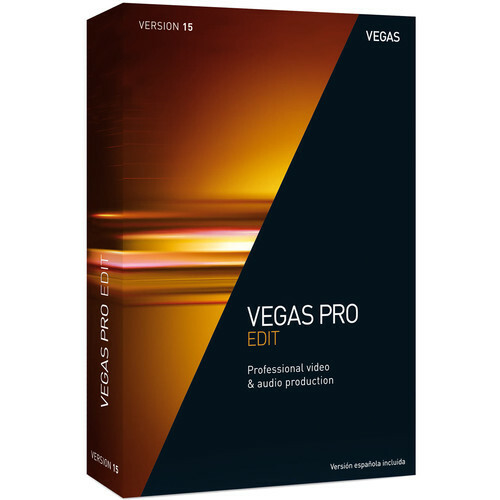 VEGAS Pro has always provided the tools for professional editing, and now, with the remodeled interface and other new features, VEGAS Pro 15 even more closely lives up to its reputation as an extensive, advanced, and intuitive all-in-one video/audio editing environment. Note: This Academic volume discount requires a minimum purchase of 5-99 units and valid proof of student/teacher status prior to activation. 1 GB recommended for 4K - required for Smart Zoom/Smart Scale/Smart adaptive deinterlacing, and GPU-accelerated video processing. For hardware rendering (NVEnc): GeForce 600 series onwards (6xx, 7xx, 9xx, 10xx), Quadro Kxxx, Mxxx and Pxxx. Requires an OpenCL-enabled GPU and Catalyst driver 11.7 or later with a Radeon HD 57xx or higher GPU. If using a FirePro GPU, FirePro unified driver 8.85 or later is required. Intel Skylake or newer processor required for QSV accelerated 8-bit HEVC/AVC decoding and encoding, Intel KabyLake or newer processor required for QSV accelerated 10-bit HEVC encoding and decoding.